In October of 1951, the beloved sit com I love Lucy aired for the first time and, according to the most extensive research I could accomplish in five minutes, became the first television show to air as reruns. Now nearly seventy years later, you can still probably catch them from time to time. And that’s good, because even a little dated, they’re still pretty funny. So to show my appreciation for the innovative thinking of Lucille Ball and Desi Arnaz, and maybe also a little because it’s still November and I am not yet finished with my 50,000 word NaNoWriMo goal, I am going to participate in the noble tradition of the rerun. Originally posted on November 20, 2013, this is my favorite practical history post about Thanksgiving. A fair number of readers have discovered this little corner of the blogosphere over the last four years, so for many of you this will be brand new old material. And those who have read and possibly vaguely remember it, will hopefully still enjoy a chuckle or two. Just no spoilers! The holiday season is nearly upon us, beginning here in the US with Thanksgiving next week. And if, like us, you’re hosting family for the big day that means it’s time to make plans for your turkey. We tend to prefer the Alton Brown brine method at our house, but I bet a fair few hosts are thinking of getting up at the crack of dawn to continually check and baste their birds until they are roasted to golden brown perfection. Other more adventurous sorts may be considering rigging up a deep fryer and spending the holiday at the hospital being treated for third degree burns. Benjamin Franklin, reviewing his collection of turkey recipes. But history suggests there may be an even better (and possibly more dangerous) way. In 1750, before he famously tied a key to a kite string and invented the lightning rod, Benjamin Franklin hosted a Christmas dinner party. Interested as he was with exploring the properties of electricity, Franklin decided to educate and entertain as well as feed his guests. 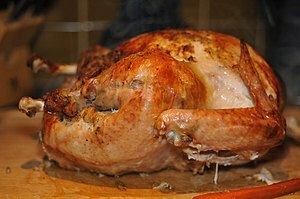 His theory was that by electrocuting his roasting turkey, he could produce a more tender meat. And he wasn’t wrong. In fact, his discovery is still important to the meat industry today, but it did come at a the expense of some personal pain and humiliation. As he was setting up an electrical jack he had designed specifically to meet all of his poultry electrocution needs, the plucky inventor received a pretty good shock himself. The gathering of witnesses to the experiment-gone-wrong reported a flash of light and a loud crack. Whereas I would have tried to pretend the incident never happened and certainly would never mention it again (Okay that’s not true. I’d totally blog about it), Franklin wrote about the failure to his brother just two days later. In the letter he describes in detail how the event made him feel, which was more or less bad. Numb in his arms and on the back of his neck until the next morning and still achy a couple days later, Franklin seems to have decided that electricity, though hilarious, is not necessarily something to trifle with (chalk up one more important discovery for Franklin). He makes no mention as to whether or not he felt tenderized by the experience. Benjamin Franklin, determined to carry on despite his shocking turkey set-back. Now I can hear the objections already: “But, Sarah, that can’t be right. Benjamin Franklin was a friend to the turkey. He had great respect for it and even fought for its adoption as the symbol of the United States of America.” I hear you, Dear Reader. And I understand your concern. I, like many of you, was an American school child so I am familiar with that story. If you don’t wish to have your image of Benjamin Franklin as the great turkey advocate shattered, then feel free to stop reading at this point and assume that I’m just full of it. But for those of you who want to know what’s what, I’m going to share the real story with you. Even though Benjamin Franklin was a part of the original committee charged with choosing a design for the Great Seal of the United States, he recommended a rattlesnake to represent the young nation. Not once did he suggest a turkey. Franklin also proposed this image of Moses and Pharaoh at the Red Sea for the Great Seal. Imagine the controversy that would have caused! The idea that he did comes from an unrelated letter to his daughter written some years later when he was serving as an American envoy in Paris. To give some perspective, this was two years after the official adoption of the Great Seal, and six years after Franklin had served on the committee, again, making no mention of the turkey. He wrote the letter in response to his daughter’s question as to his opinion of the newly forming Society of the Cincinnati, a fraternity of officers of the Continental Army. The society, founded in May of 1783, adopted for its symbol a bald eagle, claimed by some to look somewhat more like a turkey. Though Franklin didn’t oppose the society and eventually accepted an honorary membership in it, what he did not approve was the desire of some to make membership hereditary. This, he claimed, established an “order of hereditary knights,” which contradicted the ideals set forward by the newly formed republic. I am…not displeased that the figure is not known as a bald eagle, but looks more like a turkey. For in truth, the turkey is in comparison a much more respectable bird…He is besides, though a little vain and silly, a Bird of Courage, and would not hesitate to attack a Grenadier of the British Guards who should presume to invade his Farm Yard with a red coat on. I have to assume that despite his reference to the farmyard, Franklin would not wish the symbol of our nation or its high ranking officers to be the comically large-breasted domesticated flightless bird that graces our Thanksgiving tables. Perhaps he meant to suggest wild turkey, which is a full flavored, barrel-aged, American original that tends to give one courage. Or perhaps he meant the wild turkey, which hunters suggest is a slippery foe, difficult to sneak up on and evidently tricky to electrocute. Whatever his true intentions, I think it is clear that though Benjamin Franklin was certainly a great American who helped to shape the United States and provide all of its half-blind citizens with bifocals, he could also, at times, be a bit of a turkey. I hope you enjoyed this encore performance! Since next Thursday is Thanksgiving here in the US, I will be engaging in another grand tradition borrowed from the television industry and preempting my blog post for the Macy’s Thanksgiving Day Parade. See you just in time for the December sweeps! That’s a thing, right? In May of 1897, American author and humorist Samuel Clemens (or Mark Twain) arrived in London as part of a lengthy world tour. There he was greeted by the news that his cousin, a Mr. James Ross Clemens, also in London, had been gravely ill. The cousin recovered, but news spread across the ocean that Clemens had grown ill and was, in fact, on the verge of death. The news sparked tremendous worry and speculation that the beloved author would soon die. Twain would go on to live almost thirteen more years after the incident, which he found kind of funny. I mean it could happen to anyone, right? The glitch was fixed quickly and the company issued a statement and apology about the sad notices. Mark Zuckerberg, to the best of my knowledge, is still alive and well, and, if you were unfortunate enough to come across your own death notice, then you can rest assured that the report of your death was an exaggeration. I don’t know whether I was counted among the dead. I wasn’t awake at the time of the glitch, but no one offered any condolences to my family so I suspect I had a lucky escape this time. And that’s something to be thankful for heading into American Thanksgiving tomorrow. NOTE: I generally post on Thursdays, but have decided this week to post a little early so that I can spend the Thanksgiving holiday with my family, the way it was meant to be spent. Last year, I wrote about my absolute disgust that retailers were open for Black Friday sales on the Thursday of Thanksgiving, which meant that their employees were not able to spend the holiday at home with their families. Apparently, the retailers didn’t get my message as an even greater number of them are engaged in the practice this year. So, I’m going to try again, with this (slightly) revised post. I hope that you enjoy it and I welcome your comments, but please note that I will not be responding until Friday. This practical historian is taking the day off. Happy National Day of Thanksgiving on this the fourth Thursday of November when we here in the United States traditionally feel particularly thankful. But that wasn’t always when we celebrated as a nation. 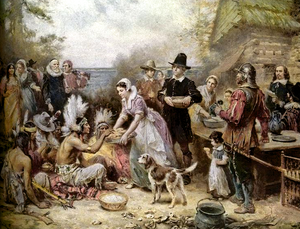 For much of our history, Thanksgiving was sporadically celebrated, with governors occasionally calling for state wide days of thankfulness. It wasn’t until Abraham Lincoln that we had a national celebration. In 1863 as a gesture of unity for a nation at the height of civil war, Lincoln issued a presidential proclamation declaring the last Thursday of November the official day. Not surprisingly, the holiday was still not uniformly celebrated until 1870, when the war was finally over and Reconstruction was well under way. After that, every year, part of the president’s responsibility was to declare the official day. And for many years that worked well, with each president following in Lincoln’s footsteps and proclaiming Thanksgiving to be on the last Thursday in November. 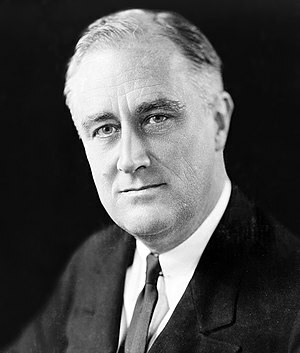 Then along came The Great Depression and Franklin Roosevelt. Listening to the appeals of concerned retailers who feared a late Thanksgiving would result in more sluggish Christmas sales, FDR decided to change Thanksgiving to Thursday, November 23, 1939. 5. Require everyone to take Friday and Saturday off for a fishing trip down the Potomac. Despite the outcry, FDR continued to ask the nation to celebrate Thanksgiving one week early and in December of 1941, Congress passed a law naming the fourth Thursday in November the official National Day of Thanksgiving. So at long last Americans were guaranteed more than 24 shopping days leading up to Christmas and as public anger faded, everyone was happy. Then came Thanksgiving 2013 when, concerned about sluggish sales and with only a measly 27 days of Christmas shopping left to the American public, large retailers took it upon themselves to cancel the holiday altogether, declaring instead that “Black Friday” would begin on Thursday, November 28. Though some may feel a little put off by your tenacity, personally I think it’s a great idea to begin your holiday sales extravaganza a little early this year. In fact, I have some suggestions for other changes you might consider as well. To get people excited for the holidays, start piping Christmas music into your stores in the last half of April. Offer free holiday gift wrapping for purchases of $50 and above after July 4th. Promote T.G.I.F. doorbuster deals beginning at 4 AM every Thursday all year long. In the month of October replace the traditional zombie, superhero, and princess Halloween costumes available in your stores with Santa suits, reindeer antlers, and elf tights. Open bright and early on Christmas morning to accommodate the returns and exchanges from those customers whose families open just one present on Christmas Eve. Then came Thanksgiving 2012 when, concerned about sluggish sales with only a measly 32 days of Christmas shopping left to the American public, large retailers took it upon themselves to cancel the holiday altogether, declaring instead that “Black Friday” would begin on Thursday, November 22. Give away slightly damaged merchandise with purchase of electronics beginning October 1. To get people thinking Christmas, put up trees decorated with shamrocks and rainbows for St. Patrick’s Day in March (Save the white and pink trees, of course, for when the real Christmas season begins in April). Open early on Christmas morning to accommodate the returns and exchanges from those customers whose families open just one present on Christmas Eve.